Here in this article, we will study about Thermodynamic Systems. Thermodynamic engineering means the field of Science which deals with energies possessed by the gases and the vapours, their conversion in terms of heat and their relationship with properties of System. The energy transfers are made during the process, which uses certain fluid contained in or flowing through System. 02) The Open or Flow System. In this system, boundaries are closed so that no substance may enter or leave the system; therefore the Mass of Substance remains constant. A transfer of Energy may, however, take place at the boundaries. A “Bomb Calorimeter” is an example of Closed System. Here Electrical Energy crosses the boundary to produce a spark between electrodes and initiates combustion. There is Heat transfer across the boundary after combustion but no Mass transfer takes place either way. The boundaries of Closed System are not necessarily to be fixed, they may move or change positions as and when the system expands or contracts. In this system, the boundaries of which are not closed but have one or more openings through which Mass transfer may also take place in addition to energy transfer like Closed System. This System is not influenced by the surroundings. 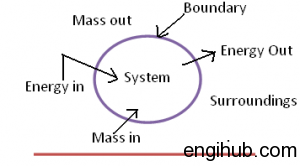 Neither the Mass nor the Energy crosses the boundary of the System is the basic of this type of System.